Hamstring issues are common but are often poorly diagnosed and treated. They are usually much more complex than ‘ a bit tight’ and need careful assessment and treatment. The whole of the spine, pelvis and lower back as well as the nerve (sciatic) that pass through the hamstring. Imbalances in the strength between quad and hamstring are common causes of overload. 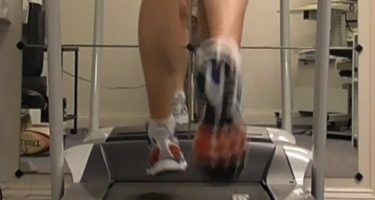 Poor biomechanics and techniques in both running and gym work also present difficulties. To get a good result, as well as treating the local tissue issues of scarring, healing muscle and local strength, you have to look at all of the above as well. There is no such thing as a simple hamstring tear! The top of the hamstring can often feel tight without actually being painful. It can be restrictive to run and give you a feeling of the leg just not coming through correctly. This is usually to do with a sacroiliac joint dysfunction (pelvis) and you can spend weeks (years in some cases) just getting the hamstring massaged before finding the solution in restoring the sacroiliac joint function. There is also a tricky condition involving the hamstring tendon which is similar in its stubbornness to the Achilles. Treatment of this has to be inclusive of technique as well as spinal issues. once these have resolved then direct work and an exercise program gets the job done. See below. Central pain is usually the most straightforward, except when there is nerve involvement from sciatic referral. It can be hard to differentiate yourself but we have tests to do so. Often the pain is more ‘nervy’ when the sciatic nerve is in play and you know you have strained the muscle because it ‘went’. Local pain to stretch and contract is usually the sign of a muscle, although the older athlete can have lots of scar tissue which reacts a little differently. Again lots we can do to treat and rehabilitate to let us have a look. The end of the hamstrings are mostly tendon but of course have the junction between the tendons and the muscles which are a vulnerable point. The semitendinosus and biceps femoris are the stringy ones and semimembranosus is much more of a blend of muscle and tendon in a ‘membrane’. All of them can become inflamed and fibrous in a combined muscle scarred / strained / tendinopathy issues. As the semitendinosus wraps around the inside of the knee it can become inflamed in the medial tendon issue. All of these are daily cases so we can get you back on the road again, whether you are a weekend jogger or elite sprinter!